ED PICKELL OFFERS ENGINE Ed Pickell was another San Diegan who wanted to fly his own airplane. 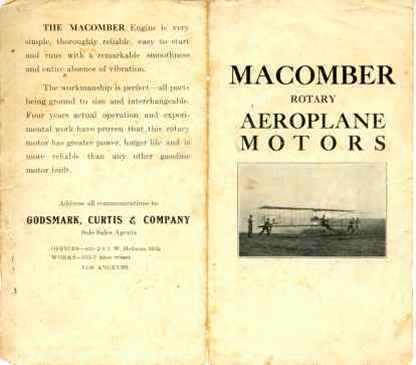 He approached the project by investing in an engine first, a four cylinder 20 cycle Elbridge Aeroplane Motor. Of course it took all his money for this and left nothing with which to build the airplane. In the latter part of July 1910, he offered Walsh the use of the engine at a "nominal monthly rental fee." The engine fit the plane's mount and propeller very well and the deal was made. Ed was going to get some of his money back and Charlie was going to obtain a great improvement in performance. The first two test flights with the 40 hp Elgridge in August, showed the engine produced excessive vibration. Charlies experimented around and finally installed a larger propeller. This made the engine run exceptionally smooth and steady. No longer was it necessary to run down hill first or to be shoved to start. The new powerplant enabled him to takeoff in about 150 feet and soar to 50 foot altitudes. At last an engine powerful and reliable enough to enable Walsh to start thinking seriously about making flying a livelihood. The Motordrome near Playa del Rey, Calif.
Motordrome between Culver City and Playa de Rey. Charlie Walsh flew aeroplane here in 1910. Won $500 & 4 cups. 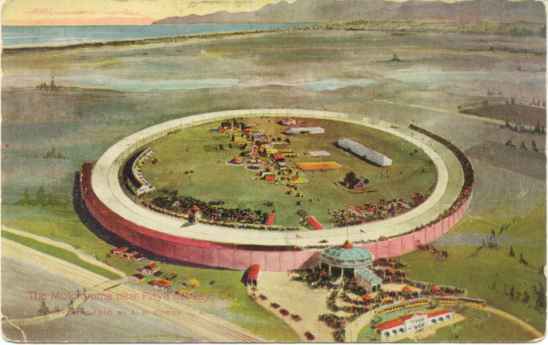 PLAYA DEL REY MOTORDROME MEET, 1910 In September 1910, the Los Angeles Examiner announced a flying meet would be held at the Playa Del Rey Motordrome on October 22, and 23rd, which would be open to Novice California Aviators only. Major prizes would be awarded including cash in four categories, distance, height, duration, and circles. The only conditions wre that all contestants be amateur, have their own airplane, and a ten dollar entrance fee. "Wow this is just what I've been waiting for." cried Charlie. He felt certain of his ability and his airplane. The only thing lacking was the expense of shipping the plane to Los Angeles. Prodded by Alice, he finally decided to ask his father for the necessary expenses. Throughout the long summer on the beach his father had not once paid them a visit. He had never seen his son fly and continued to discourage any of Charlie's flying "jim-cracks." Irish tempers were near the boiling point as Charlie stood toe-to-toe with his father and unloaded with both barrels. "Dad, I need $1,000 to enter my plane in the Los Angeles Aeroplane Contest...you can take it out of my inheritance," His dad's eyes welled up, his face flushed red, "I'm not interested, that's all the money I have saved up for you and Robert." "It's not going to be squandered on a crazy flying machine." "I don't care about your plans," "I need the money now." Charlie argued. "I'm not interested son. If it was for any purpose other than that, that dammed contraption you have down on the beach, I'd give it to you. You'll have better need of that money later on anyway." "I doubt that!" Charlie replied as he stomped out of the house. That evening his mother came to her oldest son and whispered. "Your father relented I'll have the money for you tomorrow." Again Charlie was exuberantly thrust upon Cloud 9. He had learned the trade watching Hamilton pack his Curtiss earlier that year. Now Walsh was dismantling his plane and crating it for his first public exhibition. Already he was working in a professional manner. The camp was broken at Imperial Beach and Charles Walsh went north to Los Angeles. On September 3rd, the crated plane arrived at Playa del Rey and for nearly a week, Charlie worked like a circus roustabout setting up the machine and carefully tuning the engine in preparation for the big performance. The Motordrome was built more for motorcycle racing than anything else. It was completely enclosed by grandstands, bleachers and high fencing. The infield was fairly level, but so confined that it was inadequate for flying. Promoters of the novice contest had no idea of the area needed for "aereoplaning." On September 10, Charlie made a straight away flight of about 1,000 feet across the infield. This was about as far as anyone could fly within the enclosure. He moved the plane outside the park where there was open space for extended flights and attempts at turns. CHARLIE HELPS GLENN L. MARTIN While Walsh was having great success, another novice in Santa Ana, California was having difficulty getting his airplane into the air, he had made numerous attempts, wrecked the pusher several times but valiantly continued to try and unlock the secret orf flight. He too wanted to enter the amateur contest at the Motordrome. Hearing of the Walsh flight, he asked Charlie to come to his aid. He arrived to find the fellow plagued with troubles very similar to those he had experienced earlier. The plane was basically of sound design but was under-powered with the Ford Model T automobile engine and out of balance. With some work and tinkering, including added wing tip surfaces, the plane was made flyable. Charlie made several short hops and pronounced it was all he could do until a more reliable engine could be obtained. On the last flight, Walsh took his immaculately dressed friend for a flight, the first time he had been up over 20 feet. The bespeckled fellow politely thanked Charlie and promised to meet him at the contest. The appreciative genleman in the bright celluloid collar wa Glenn L. Martin. On October 22, the Novice Aviator Meet got underway. Several would be famous flyers were present: Glenn Martin, The Eaton Bros., Jack Cannon, Charles Walsh, and an unknown fellow with a Santos-Dumont Demoiselle. The directors decided to hold the event outside the Motordrome if the entrants so wished. Charlie was pleased with this new freedom and made several straight away flights, one of 4 1/2 minute duration on his first attempt. Call it what you will, courage, over enthusiasm, thoughtlessness, or showmanship, but,. neglecting to heed what Hamilton had warned him about turns Charlie banked right on this first turn right into the propeller torque. The plane made a violent dip, skidded and then shakily returned to normal. One could see Charlie trembling at the controls but his Irish luck stayed with him. He had learned a lesson, however. Undaunted he proceeded to make three circuits in both right and left turns around the field. On the second day Walsh led the way again by rising to nearly 80 feet in altitude and flying to nearby Redondo Beach and return. The crowd gave him a standing ovation for Charlie Walsh had saved the day and the gala affair from financial disaster. The other contestants failed to do anything significant. The Eaton Boys cracked up their machine and the Demoiselle could only make short jumps. Glenn Martin was plagued with mechanical troubles and never really participated. With his daring showmanship, Charlie Walsh won all the prizes consisting of four large silver loving cups and $500 in cash. Awarded were: The Examiner Trophy for duration 14 minutes; The San Diego Cup for the highest flight, 80 feet; The Whitley Trophy for endurance; and The Leonard-Smith Cup for circular flights. The first thing Charlie did with the money was to reclaim Alice's wedding rings from the jewelers. HARRY HARKNESS FINANCES CHARLIE The family was at the meet and not coincidentally met a wealthy New York businessman/sportsman, Harry Harkness. Harkness had interests in California, and had recently formed the Aero Club of San Diego and was sponsoring an aviation venture on the Spreckles North Island flatlands along with Glenn Curtiss. He planned to build hangars and workshops to build and repair aeroplanes and turn the unwanted island into a permanent airfield for all those interested in aviation. Harkness had already purchased two Antoinette monoplanes and wanted a lightweight biplane to try out a new and unusual rotary engine. He had kept tabs on Walsh's ability and offered him $5,000 to build the airplane. 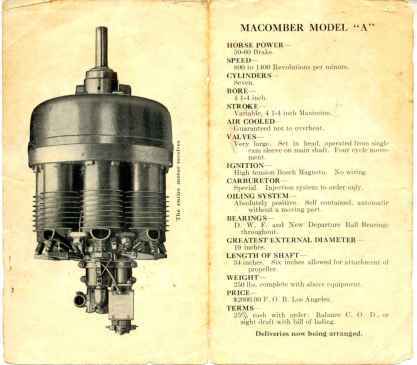 THE MACOMBER Engine is very simple, thoroughly reliable, easy to start and runs with a remarkable smoothness and entire absence of vibration. The workmanship is perfect--all parts being ground to size and interchangeable. Four years actual operation and experimental work have proven that this rotary motor has greater power, longer life and is more reliable than any other gasoline motor built. OFFICES--421-2-3 I. W. Hellman Bldg. Very large. Set in head, operated from single cam sleeve on main shaft. Four cycle movement. High tension Bosch Magneto. No wiring. Special. Injection system to order only. Absolutely positive. Self contained, automatic without a moving part. D. W. F. and New Departure Ball Bearings throughout. 34 inches. Six inches allowed for attachment of propeller. 250 lbs. complete with above equipment. $2000.00 F. O. B. Los Angeles. 25% cash with order; Balance C. O. D., or sight draft with bill of lading. There was no trouble installing the engine or fitting a proper propeller. Just before the plane was completed, Charlie put Silver Dust into the unbleached muslin flying surfaces. This was done for appearances sake only and provided a name-The Walsh Silver Dart. The plane was taken to Playa del Rey for tests in May 1911, and everything proved successful. A number of flights were made including a family airplane ride. Charlie surprised Alice one day by taking her up for a view of the world from 50 feet up and at 40 mph. Without hesitating; she climbed onto a small seat Charlie had provided along side his, she pulled Kenneth up to sit behind her and Little Juanita she held on her lap. All held on to whatever appeared fixed and sturdy. The Macomber engine wheezed and whirled as the Silver Dart lifted the crew to dizzy heights and then eased them gently to earth. The flying family outing was a straight away flight and for only about 1000 feet, but the newspapers hailed it as the first family to ever fly together. Collection of John Grammer, 9-15-09 John has very kindly shared with us some copies of the brochure she recently acquired. If you want to see those copies, which thoroughly describe the engine, click on the title.